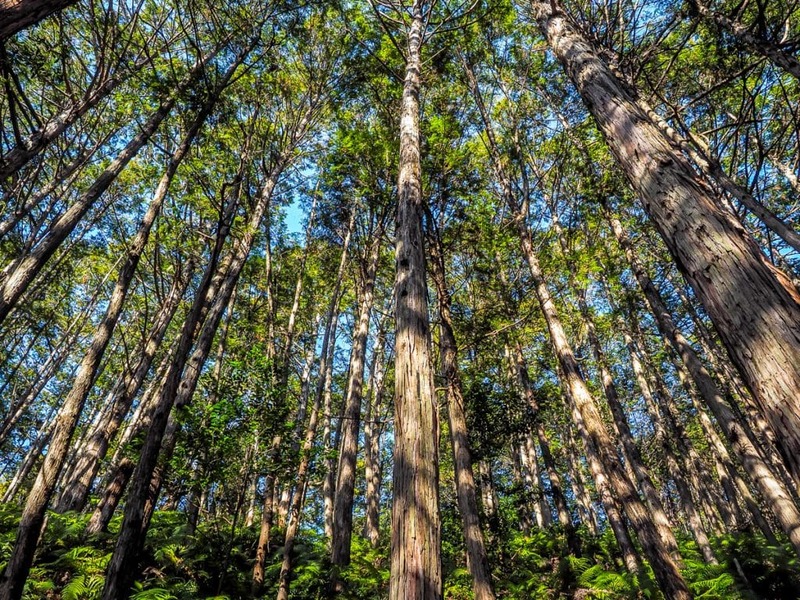 The Kumano Kodo is a network of pilgrimage trails that connect various Shinto-Buddhist sites in the mountainous Kii Peninsula south of Osaka and Nagoya, and is considered one of the world’s great pilgrimages that travelers can easily join. 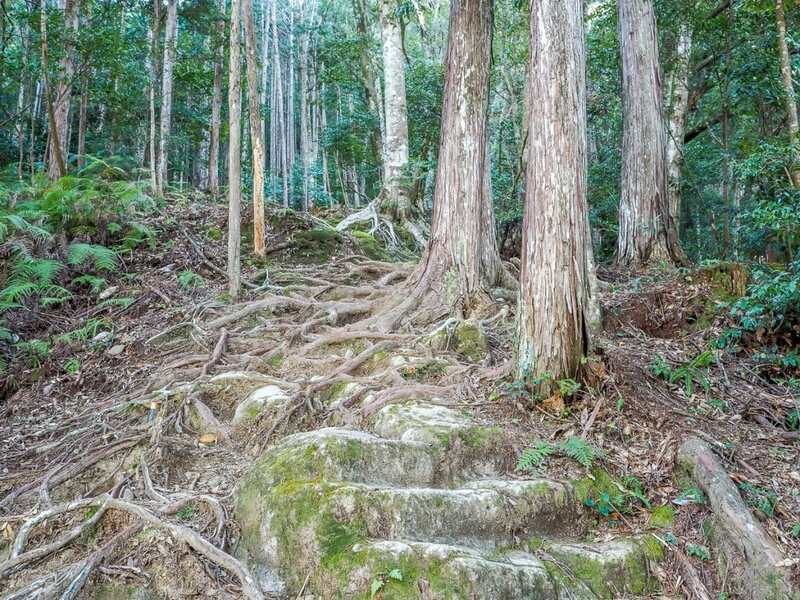 These expansive tracts of wilderness are replete with spiritual sights that have attracted pilgrims for 1000+ years, and today you can do Kumano Kodo walk in the footsteps of priests and emperors of the ancient past. Visitors from Asia should definitely consider this 5-Day Osaka-Kumano-Wakayama area JR pass or this 7-day pass which covers a larger area. The Kumano Kodo trek’s temples, hot springs, and the sacred mountain-top temple town of Koyasan, are collectively classified as a UNESCO World Heritage Site. I visited Kumano Kodo in winter, in the coldest month, February, which proved to be very rewarding, for reasons I’ll describe below. Check out this article for tips on what to pack for winter in Japan! I didn’t actually do the entire Kumano Kodo walk, but instead based myself in the area, staying at J-Hoppers Kumano Yunomine (see reviews / check prices), one of the best hostels I’ve ever stayed in, and busing or hiking to various spots to take in the temples and hot springs. From there, I also hiked the short Dainichi-goe route of the Kumano Kodo. I’ll explain below why I did this, so you can decide what’s best for you! When most people talk about the Kumano Kodo walk, they are referring to the Nakahechi route, which starts on the west coast of the peninsula near Tanabe and finishes at the Kumano Sanzan, three extremely important temples located in Hongu, Shingu, and Nachi. Hikers usually spend 2-4 days on this route, depending on exactly where they begin and end. East of Hongu, the trail splits and heads to the coast, terminating at either Shingu or Nachi. 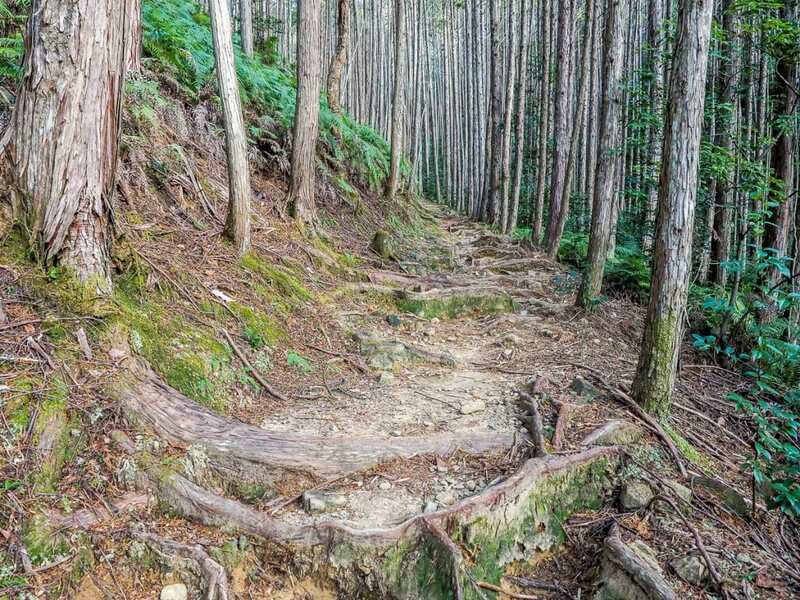 The four-day, north-to-south Kohechi route is a more difficult Kumano Kodo trek that connects Koyasan to the Kumano Sanzan. The Ohechi route runs along the coast from Tanabe to Fudarakusan-ji Temple, and finally, the Iseji route heads north along the coast from the Kumano Sanzan to the Ise grand Shrine. 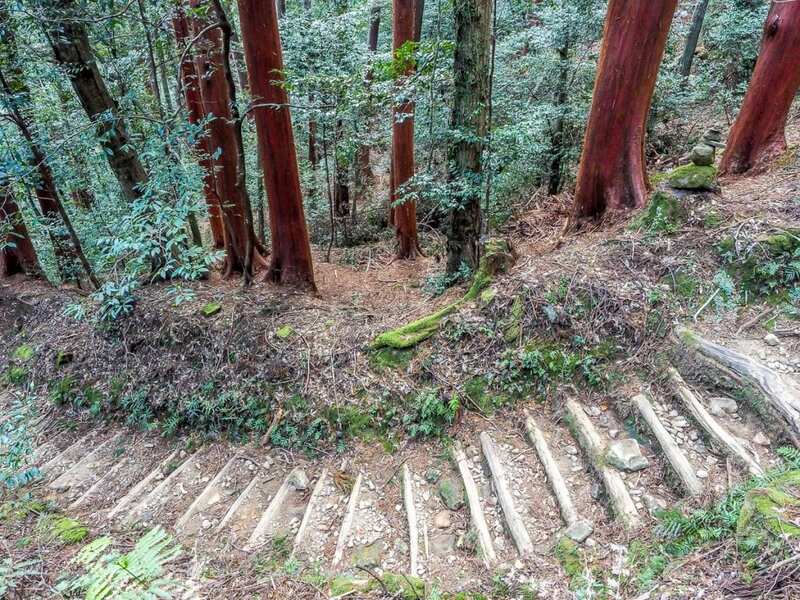 See this page for full kumano kodo route descriptions and links to route maps. 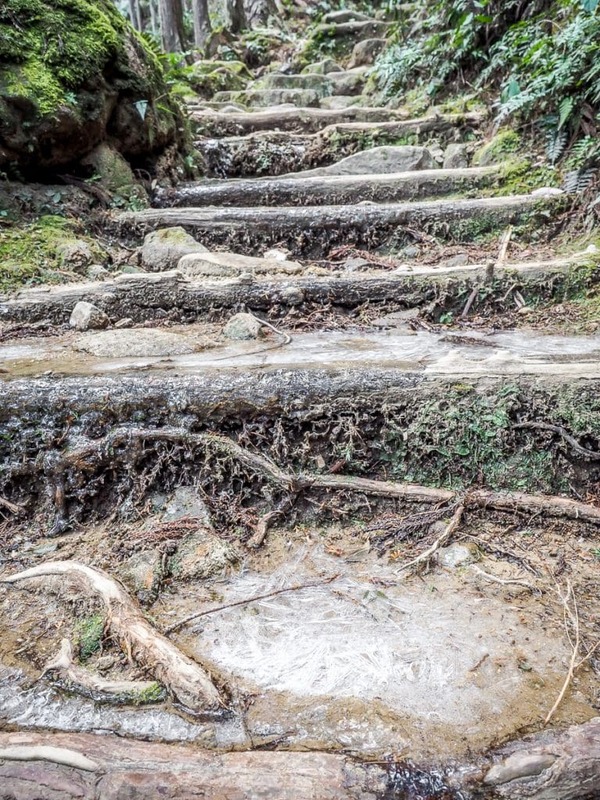 If you plan on visiting or hiking the Kumano Kodo in winter, you will be rewarded with trails nearly devoid of people, and those hot springs at the end of the Nakahechi Route (or the temple-stay onsens in Koyasan) will feel that much more soothing. The places you are most likely to see snow, if any, are Koyasan, and some higher-altitude sections of various routes. During my trip, there was a cold spell and record snows across Japan. In Koyasan, the skies were dumping snow when I visited (see photo above), which made the whole landscape look like a surreal Buddhist wonderland. 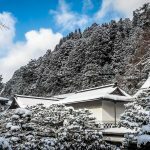 See this page for lots of snowy pics and my full write-up on visiting Koyasan in winter. However, when I visited the Kumano Sanzan and did a small part of the Kumano Kodo from Yunomine to Hongu (see below), the trails were mostly snow free, with just a bit of frost on the ground in the upper portions. The lowest temperature I experienced was at Koyasan, which was -9° early in the morning. This was bloody cold, especially considering most temple accommodations there are barely heated (and I come from Canada, where it gets much colder in winter!) 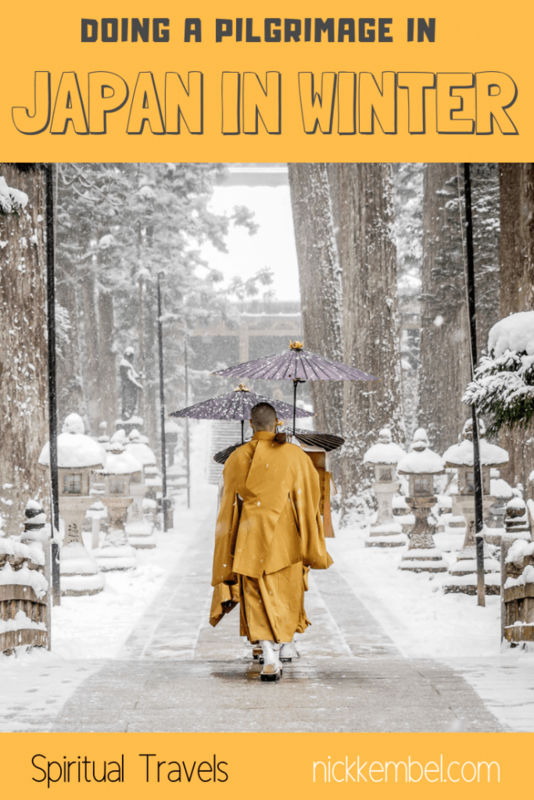 You need proper, full winter gear for visiting Koyasan in winter, no matter where you come from. 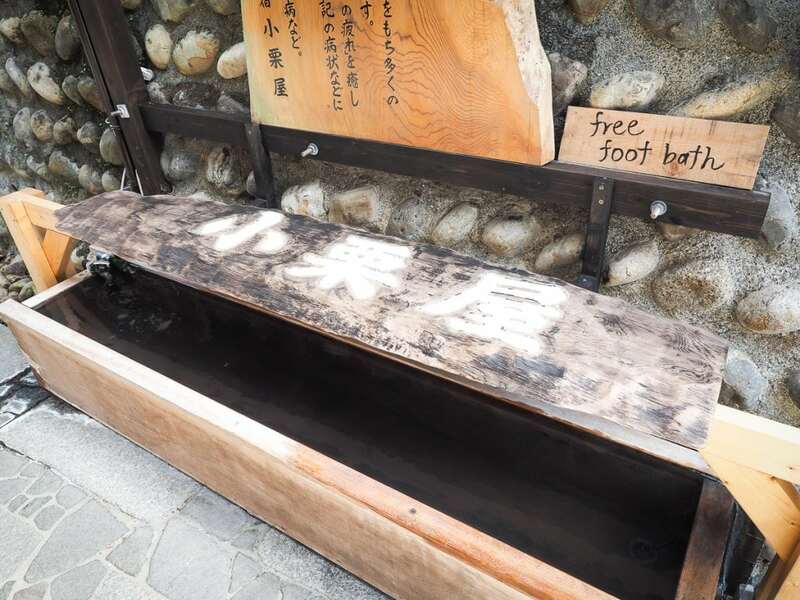 When I stayed in tiny Yunomine onsen for three days (more details below), the lowest temperature was just below zero. My experience doing short hikes in the area was that you need to wear quite a bit when you start off in the morning, but when you continue hiking and your core heats up, you end up getting sweaty and shedding layers. Gloves, winter hat, and several layers beneath a good winter jacket are still essential for doing any part of the Kumano Kodo in winter. 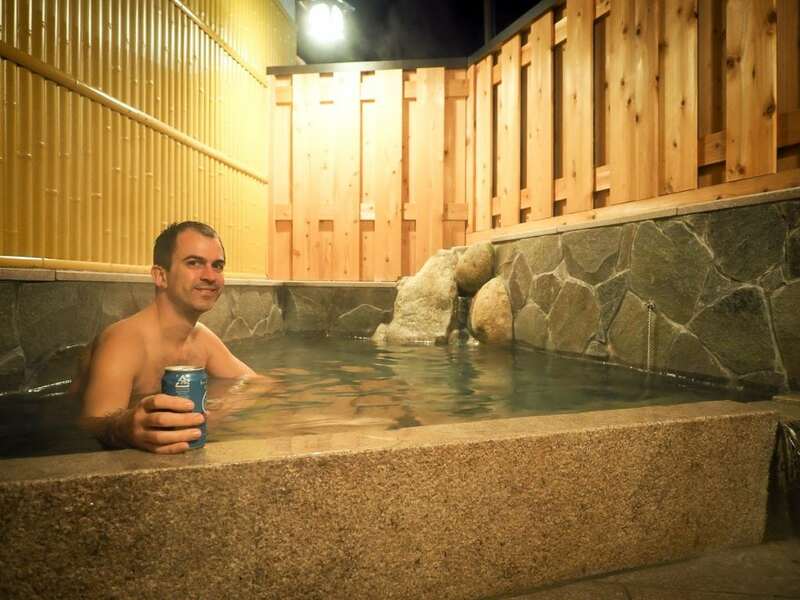 If you don’t want to hike the full Kumano Kodo, then I would suggest you do as I did: I bussed from Koyasan to the area and stayed at J-Hoppers Kumano Yunomine (see reviews / check prices) in the tiny Yunomine Onsen for three nights. I don’t usually like hostels, but this one has incredible capsule-like dorm beds, great staff, and even onsens that you can use privately! This was easily one of my best hostel experiences ever, and I’ve stayed in many! From Yunomine, I could walk to several awesome Wakayama onsens and also do a small portion of the Kumano Kodo called the Dainichi-goe route, which goes over a small mountain from Yunomine to Hongu (1.5 hours). You can then return the same way or take a 10-minute bus ride. For me, this was the perfect amount of hiking to get a good taste of the Kumano Kodo without spending multiple days slogging up and down the mountain trails. I can understand the appeal of doing the whole thing, but some of the hikers I talked to did confirm my suspicions that some of those days on the mountains did get a little tiresome and repetitive. 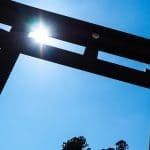 The Dainichi-goe route connects two of the most interesting spots on the Kumano Kodo: the hot spring village of Yunomine, and the Kumano Kongu Taisha shrine and enormous Torii gate at Hongu. The trail is quite lovely, and I loved the beautiful red Hinoki trees. I had a very relaxing three days in Yunomine, doing the Dainichi-goe route and other day walks, then soaking in my hostel onsen at night. Next, I caught a bus to Shingu and Naichi to see the other two grand shrines. 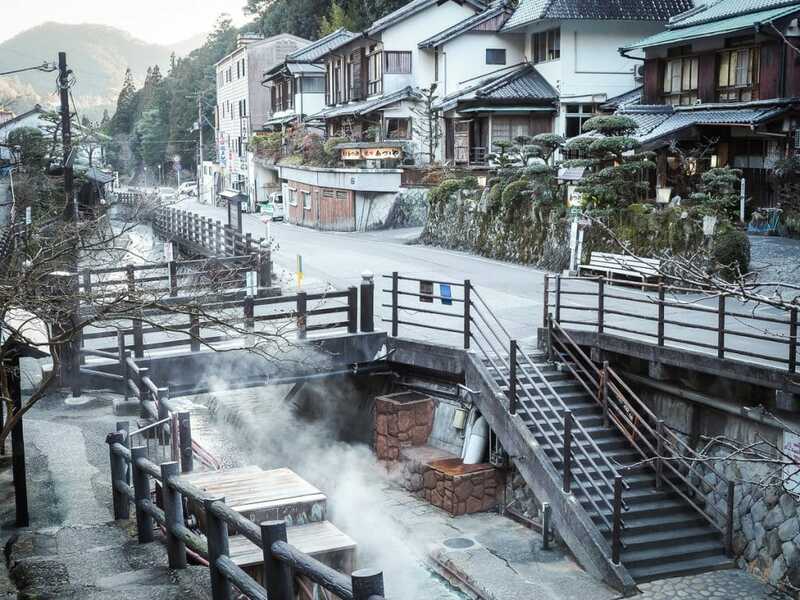 If you catch the early (6:30am) bus, you can easily see those two shrines and the Nachi waterfall in one morning, then either spend the night at Katsuura and enjoy more hot springs as I did, or catch the train to your next destination. If you travel to Osaka and back by train, plus train to the Kansai International airport on one of those days, this Nankai two-day pass saves you money. If you train to and from Koyasan and plan to also visit other areas in Kansai (like Nara, Kyoto, etc. ), consider getting the Kansai Thru Pass. 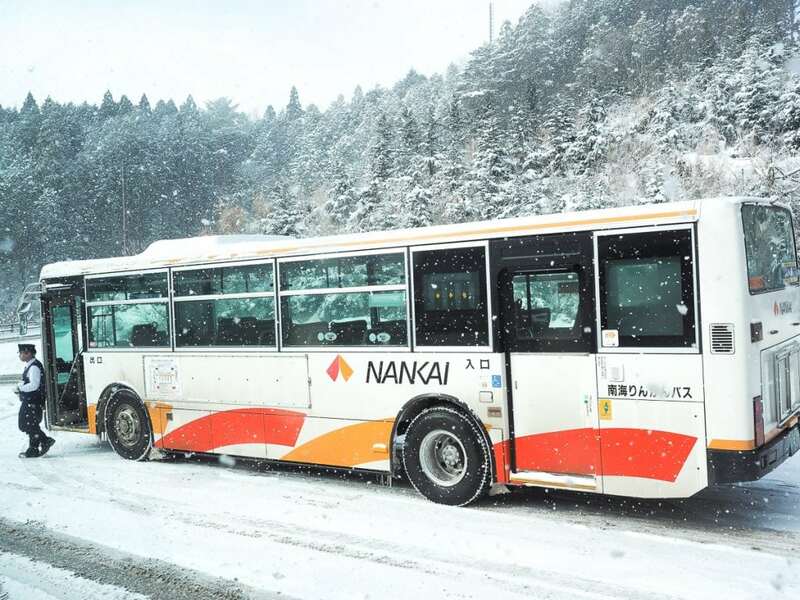 Bus Gojo to Hongu/Yunomine: 5 hours (the longest public bus route in Japan!). Only a few per day, so check the times! There is a direct bus from Koyasan to Hongu/Yunomine (5.5 hours) via Rujin Onsen, but it is only available in summer. Note that most of these buses only run a few times per day, so it is essential to check times beforehand. I was able to use my ICOCA (Osaka IC) card on some (Gojo to Yunomine) but not all (Yunomine to Shingu and Nachi) of the buses. You can hop on the train from Katsuura or Nachi Station to Ise. From Ise I connected to Nagoya, where I boarded a Shinkansen (bullet train) towards Mt. Fuji and Tokyo. There are also connections from here to Osaka and other places in Japan. If you plan to take lots of trains in the area, definitely consider the 5-Day Osaka-Kumano-Wakayama area JR pass or this 7-day pass which covers a larger area (available in Asian countries only). If you are planning to do the Kumano Kodo walk, I would urge you to consider doing it in winter! 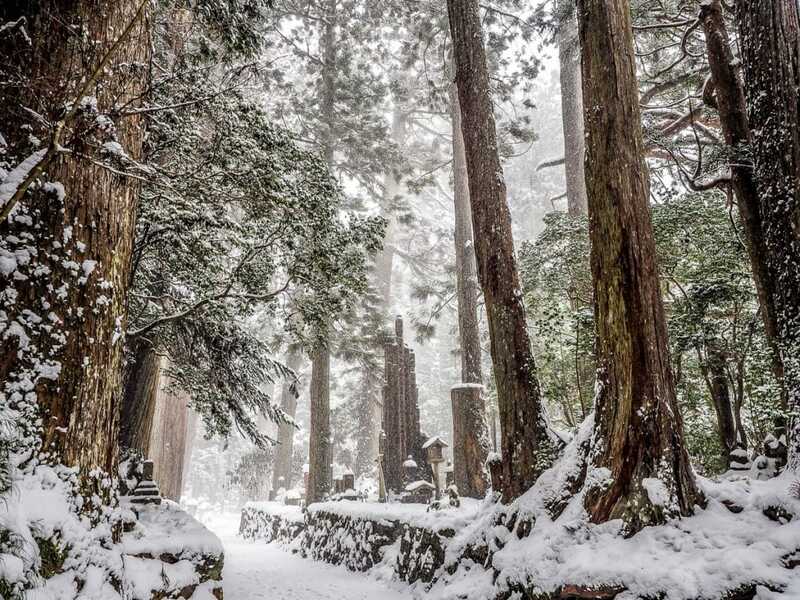 Trekkers on the Kumano Kodo in winter are rewarded with empty trails, soothing hot springs, and (if you are lucky) the chance to see it all under a blanket of snow! Thank you so much for posting all of this great information. I went to yunomine this year (beginning of February) and fell in love with the place. 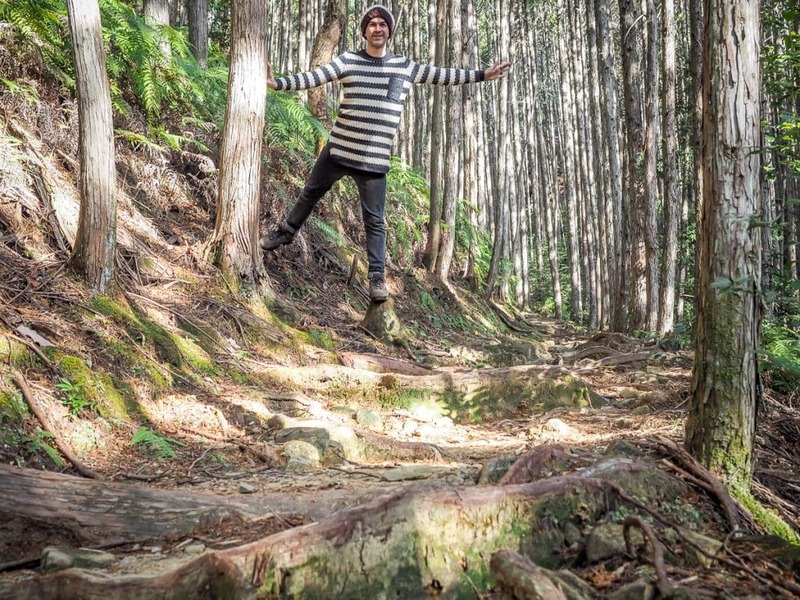 So many day hikes to do and shrines to explore! Thanks, and I fully agree! I would easily go back without thinking twice!